While I was cruising around in my stroller at Global Pet Expo 2013, I found real milk that is made for dogs! It is called MilkOpet. MilkOpet is cow's milk that is lactose free. It is a delicious, healthy treat that dogs can now digest. Naturally, I wanted to try some. I barked at Mom to tell her I wanted some MilkOpet. 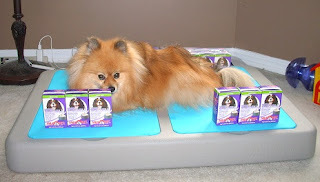 Soon after we returned home, I received a box full of MilkOpet! Let's do the Happy Pommie Wiggle Dance! This is my MilkOpet! I do not have to share it with humans! Look at all of the delicious milk! Humans have always been able to enjoy milk. Now we can enjoy it too! Milk has always been known as a nutritious drink, the perfect food for humans. 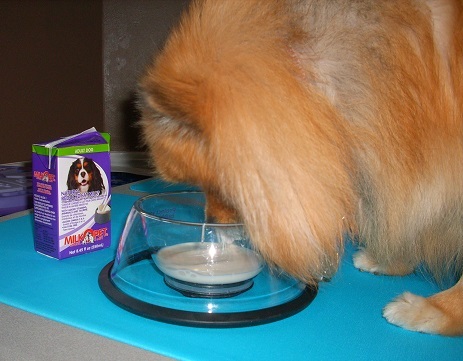 Most dogs and cats can't digest lactose, so we haven't been able to drink milk. Now we can! The lactose problem has been solved! Not only is MilkOpet lactose free, it also has added nutrients to make it even healthier for dogs! The dogs in Japan have been enjoying MilkOpet for years, now it is finally available in the USA! Is it time to open and taste it yet? I can smell it, why can't I get any? I love MilkOpet! When I see the container come out of the refrigerator, I follow it around. Then, I hover around the bowl, waiting for Mom to get out of my way. 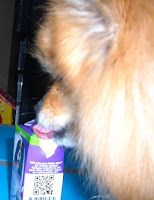 MilkOpet is a delicious way to encourage proper hydration. MilkOpet may entice a dog that is bored with water to drink a bit more. 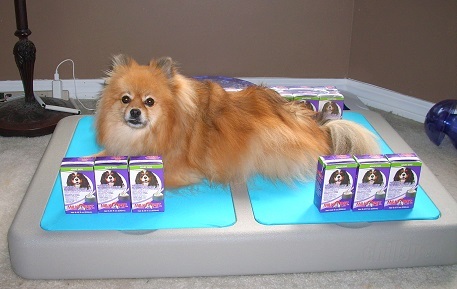 MilkOpet is available in 3 formulas: Adult, puppy, and less active. The adult formula is considered a reduced fat product with only 4% fat. 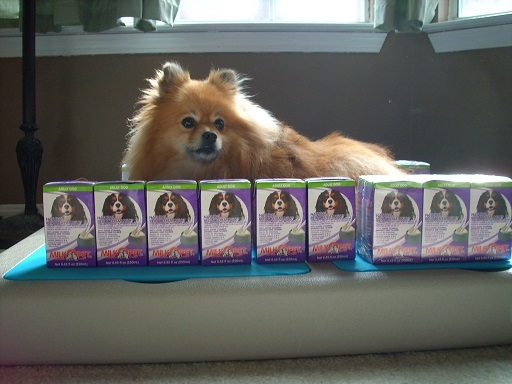 The puppy formula has 5.25% fat, and the less active formula has 3% fat. Now I can reach it! The Dairy cows that make the milk for MilkOpet live in beautiful green Australian pastures. They breathe fresh, clean air, and produce some of the best milk in the world. MilkOpet is pasteurized using the UHT (Ultra-High Temperature) process. It does not need to be refrigerated until after it is opened. Once it is opened, it can last up to seven days in the refrigerator. Note to humans: refrigerate MilkOpet once it has been opened. Now we can join our humans with a bowl of cereal (kibble) and milk for breakfast! How about milk and cookies? BOL!! There are so many new possibilities! Would you like to try some MilkOpet? Summit Pet is a wholesaler, but their customer service can help you locate a local MilkOpet retailer, if you are located within their region. Pet Supplies Plus has stores in several states that carry MilkOpet. I received enough MilkOpet to share with one lucky pal! The winner will receive 2 six packs of adult formula MilkOpet! Please log into the Rafflecopter for entry options. BOL! 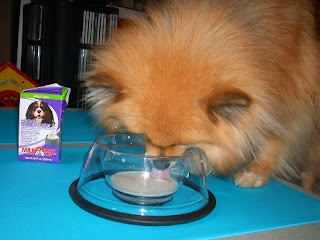 My mommy has been drinking fat-free lactose-free milk fur years, because she can't digest the straight stuff either. It doesn't have extra nutrients in it fur doggies, but I wonder if I should ask her to share? Milk and cookies? Delicious! Milk and kibble? Probably really good! Do you think they gave you enough MilkOpet, Pepper? BOL It looks like a good month's supply! Pepper I don't get milk to drink but you sure make it sound absoluely delicious I would love to have a chance to win and give it a try. Milk and home made doggie cookies would be very good together! Looks like you love it Pepper! My favorite feature is that it doesn't have to be refrigerated until after it is opened. I would like the less active formula for my older dog. Comment, Comment Me wants some please! Hey there! I was just over at Oz's bloggie, and he said this MilkOpet was some delish stuffs, so I had to come over and see what it was all abouts!! It really does sound FABulous Pepper! Count me in the giveaway! Pooch milk! How fascinating. I've never seen this before. Looks like you really like it, Pepper! Maybe my Smoosh should give it a go sometime. This is such a cute idea. I had to enter, I think I'm in all your giveaways now Pepper! lol. I would like the less active milk, for Kirby's brother Poe, he is 8 years old now and it has become real hard to keep him in shape, so this stuff might be better for him then the adult! Great product!!!! Received some samples and not only does my dog love it, but also my cats!! !